Theta DS Pre D/A Preamplifier: digital signal processor/preamplifier. Dimensions: 19” W x 15” D x 3.75” H. Weight: 29 lbs. Price: $4000 ($3200 without control center). Approximate number of dealers: 40.
above: Theta Digital DS Pre basic (top) and a Theta Data basic transport (bottom). When I first set foot in the McCormick Hotel at the 1988 Summer CES, a lot of the hot gossip appeared to be centered around Theta Digital’s DS Pre. Even people I ran into who had previously shown their distaste for anything digital were foaming at the mouth about how musical and “analog”-sounding this product was. It is not, of course, possible to really judge any thing at a CES. But my initial two encounters with the DS Pre at the show confirmed the general consensus: this product is something special, and may well be considered a mile stone in the further refinement of digital audio reproduction. I know the skeptics in the reading audience are probably thinking about turning to another review, reaffirming their automatic bias against anything non-analog. And I readily admit that I have been one of the enemy, since I actually use CDs as source material in my earlier reviews. Horrors. But before you damn the DS Pre, yours truly, and digital audio in general, I suggest you read the following review, and take a listen to a product that just might make you think twice. The DS Pre is a signal-processing control unit for all digital audio components having a standard serial digital output, including CD, DAT, Digital Laser Video, et al. It can be used as a line-level preamp (no phono section is included), or in conjunction with an existing pre amp, its active volume and balance controls capable of being bypassed. There are two inputs for digital source material, as well as one digital tape monitor circuit access located on the rear panel, served by standard RCA jacks (this product is electronically, not optically, coupled with source material). A novel “thru-put” analog input allows addition of an upstream preamp, or any other line-level source (tape, tuner, etc.). Analog output (fixed or variable) is also fed through standard female RCA jacks. The front panel has eight toggle switches similar to those used by Audio Re search: four serve the digital domain (input selector, tape monitor, channel reverse, absolute phase reverse), and four control power, mute function, upstream thru-put signal bypass, and fixed or variable volume. There’s a large volume control on the far right of the faceplate adjacent to the left- and right-channel balance trim pots. There are also two red indicator lamps placed in line with the front switch array: one for power, the other to confirm digital source connection. The review unit in my listening room is entirely finished in black, except for the gold-plated Theta logo located on the front left of the faceplate. In my discussions with Neil Sinclair and Mike Moffat, the two founders of Theta Digital, it was clear that their philosophy follows a clear divergence from accepted past practice in digital audio design. Rather than looking for new methods to cover up the sins of imperfect digital-to-analog conversion, as has been pretty much SOP so far; they have decided to take the bull by the horns and build a product that gets the conversion right in the first place. They claim that this will allow the listener to hear all of the musical harmonic textures and detail, without the “warm, sweet, but blurred” colorations required to make most digital material palatable. I’m not so sure that this design goal is entirely original, but the DS Pre appears to be the most successful attempt that I have heard so far. The DS Pre uses non-switching, 8x-over-sampling digital filtration and conversion, followed by a 6dB/octave, single-pole low-pass analog filter, with less than 30 degree of phase shift in the audio band. It also incorporates seven separate power supplies, in order to insure “that current draw in one area won’t compromise performance in another.” Mike Moffat claims that the DS Pre is the first digital audio component to use a digital filter with a proprietary composite algorithm which optimizes for time domain, group delay, transient ability, and frequency response. According to him, all other designs use a single-purpose filter chip optimizing only for the latter. He also claims that the Theta-designed filter, which appears to use a DSP chip per channel, each served by two ROMs (Read-Only Memories) to hold its coefficients, has a tenfold increase in computing power over all others. The DS Pre is capable of 80 million computations per second, reserved, I am told, mostly for phase and time error correction. But perhaps the most revolutionary feature of the DS Pre is the fact that its digital filters are programmable, allowing the owner to easily upgrade the unit in the field as software becomes available from the manufacturer. Changing the filter is easily done (if I can do it without screwing up, it must be easy): simply remove the cover; pull out the tour ROMs, and replace them with the upgrades. The idea of variable software programmability is a stroke of genius; rather than having to send a product back to the manufacturer for upgrades (we all know about those hassles), the owner will be able to totally change the sonic characteristics in ten minutes. Tweakers will love it— rather than having to deal with VIA, they can play with interchangeable ROMs. 2. I have not yet had the opportunity to audition the Wadia digital processor, which appears to be the Theta’s only serious competition. 3. The Wadia is capable of 72 million computations per second, used mostly, I believe, to implement its 6 oversampling digital filter. The DS Pre is built like a tank. In order to pre vent external digital interference, the chassis is composed of solid steel, plated first with cop per, then with zinc. Internal layout of components is neatly done with the four ROMs easily accessible on the main board. The unit is sup plied with one Straight Wire Videolink cable, to access digital source material. Output from my review sample was single-ended only. By the time you read this, the DS Pro (digital section without preamplifier capabilities) will probably be available in both single-ended and balanced configurations. Costs of the DS Pro, at press time, are slated to be set at $3200 (single-ended) and $4000 (balanced). I plugged the DS Pre into my present reference system, which consists of a Mark Levinson No.26 preamp, No.23 power amplifier, and B&W Matrix 801 Series Two Monitors. The DS Pre was auditioned as a control preamp directly into the No.2 3 (in single-ended mode), bypassing the No.26, and as a fixed-level digital processor into the No.26’s line-level input. In this configuration, connection between preamp and power amp was auditioned in both single- ended and balanced modes. CD players used included a Rotel 820BX2, Philips CD880, and two different Adcom GCD-575s. Interconnect between all components consisted of Madrigal HPC, and Audioquest’s LiveWire Emerald and Lapis. Speaker cable was LiveWire Clear in bi-wired configuration. 4. Neil sent mean extra set of ROMs to play with that extend the bandpass to 21.6kHz (20kHz is standard). Although the new filter produced a slightly more open quality of sound, it injected a noticeably hard, glassy sheen to the upper midrange. 5. Since digital source material has a bandwidth of between 2.2 and 3.0MHz, Theta claims that choice of cable is critical. I agree. I auditioned several interlinks, and also found the supplied Straight Wire Videolink to sound best. 6. The first Adcom GCD-575 began exhibiting sonic problems a few months after adding it to my system. It was replaced with a properly operating duplicate about six weeks ago. My first impressions of the DS Pre were not so good. From the beginning, I was bothered by a rather loud “ticking” noise, occurring at sometimes regular (every five seconds), some times irregular intervals. Although Neil was at a loss to explain the origin of the problem, he suggested that it could be due to a poor digital source connection caused by the smaller- than-standard Cardas RCA jacks used on the early production units, and that crimping the outer portion of the male connector might help. This made some difference, although I was still plagued with sporadic ticking. Neil asked me to sit tight until they could duplicate this phenomenon at their lab, which dropped rather a large fly in the journalistic ointment. At about this time, John Atkinson came through town, which coincided nicely with a meeting of our listening group of musicians from the National Symphony. Although the evening wasn’t altogether a lost cause, the general consensus followed the lines of “that damn ticking is so distracting, I really can’t make any determinations.” (Murphy’s Law always seems to strike at the worst possible time.) Two weeks later, Neil informed me that they had seen two other similar problems in the field with the DS Pre, and had narrowed the fault down to high-frequency RF interference. It hadn’t dawned on me, but since my listening room is located about one mile from the Pentagon, with all of its microwave and security transmissions, the possibility of RF made a lot of sense. The next day, I had a new DS Pre with an RF blocking filter in place, and a case of sonic apples and oranges. Not only was that irritating ticking gone, but the sound was so much more musically involving and realistic. Deeper soundstage better bass extension, more transparent, less brittle and bright, and, last but not least, a sense of clarity I had never before heard from anything other than master tapes. Finally, I could do some serious listening. In my system, the DS Pre definitely does better when fed through the No.26 preamp (balanced or single-ended between pre- and power amps). Although the Theta seems particularly immune to cable interactions (output impedance is 2 ohms! ), it did seem to lose a significant amount of openness, musical finesse, and overall clarity when routed directly into the No.23 power amp. When I tried the same thing with an Adcom GFP-555 preamplifier, however, the tables were turned: the sound became congested, opaque, and grainy with the preamp in circuit. So it appears that the quality and transparency of the downstream preamp are of utmost importance in this case. After spending several hours trying the DS Pre in both configurations, I decided to do all listening for this review with the No.26 in line, using a balanced connection to the No.23. The DS Pre also appears to benefit from use of an Adcom ACE-515 Power Enhancer. Insertion of this AC filtration device significantly improved overall clarity by removing a slight (and I do mean slight) “mist” covering the sound. 7. The mystery was compounded by the fact that the Adcom GCD-575 seemed to produce much more of the irritating ticking than the Rotel or Philips. 8. In spite of this, we all had a good time playing records, discussing music, and generally raising bell. 9. Theta has Informed me that they are including the R.F blocking filter in all current production units. Next, I decided to do comparative listening using all three source CD players (Adcom, Rotel, and Philips). One would assume that digital information originating from different CD players would be identical, right? Wrong! While the Rotel and Philips machines sounded pretty much alike (the Philips winning by a small but discernible margin), the Adcom was a different story altogether. In comparison with the other two, the Adcom sounded dull, tubby, lacked transient definition, masked ambient information the others retrieved, and produced a more distant perspective. So the theory that it doesn’t make any difference what type of digital source is used with outboard D/A converters just got blown out of the water. It has been suggested to me by people with more knowledge than I of digital theory that flawed error correction in this sample of the Adcom could be the cause of the sonic difference. Perhaps. Whether this is the case or not, I would advise anyone interested in purchasing a DS Pre to audition different CD Players with the Theta before making any final decisions. For purposes of this review, almost all listening was done with the Philips CD880 in line. I also auditioned all three source players without the DS Pre. Not bad, but no cigar. Four grand is a whole lot of money for some thing that is basically already included in most digital source hardware so naturally one might well ask if the DS Pre really gives that much sonic improvement. I would have to say yes, although one of my musical colleagues felt that, while it does give some improvement, it just ain’t worth that many bucks. His point is well taken...if you plan to use the DS Pre in a $3000 system. But if you’ve invested significant time and money into obtaining the closest thing to the original (or, some would say, absolute) sound, then it’s probably worth considering. Perhaps the best-value/performance ratio can be ascertained by comparing the DS Pre with one of the most respected and established CD players now available: the California Audio Labs Tempest II ($3000 current retail price). One of the arguments against digital in general is the lack of natural three-dimensional space and ambience retrieval. Well, that argument just went out the window, because the Theta does what no digital source before had done for me: It recreates the natural space and soundstage present at the recording site as well as anything I have yet heard. Front-to-back, lateral, and vertical dimensions are remarkably well reproduced, without exaggerating or diminishing the sizes of the ensemble or of individual performers. Skeptics who feel that digital source material doesn’t contain any natural spatial information should first listen to the Theta, then open their mouths. While the DS Pre is not particularly sensitive to interconnects, I have found its lack of colorations and superb transparency to show up the strengths and weaknesses of different cables better than the more output-sensitive Tempest II. Our musicians’ listening group auditioned complete systems (source/pre amp/power amp) of Madrigal HPC and Live- Wire Lapis in double-blind tests, and unanimously preferred the Lapis. While we all felt that it brought the entire soundstage closer to the listener, it reproduced overall harmonic textures, delineated individual musical lines, and generally sounded more “real” than the HPC. While I’m not willing to unconditionally state that the Lapis will be a better cable than HPC in all instances (cables are much too system- dependent), it is definitely the more musically believable of the two in my system. 10. Using recordings in which I have been artistically involved, so as to be able to credibly compare original vs reproduced. Perhaps the most intriguing aspect of the DS Pre is its ability to open up the sound, placing the listener at the microphone and unraveling complex musical material in a natural way, without sounding antiseptic. In some ways, it is very similar to the B&W 801 Series Two Matrix Monitor, a speaker I still feel to be just about the most musically accurate currently available. It doesn’t take away or add, but merely passes an honest signal. The Theta may appear to produce a forward perspective in comparison with the Tempest II. But I believe it to be actually accurate in this respect, the CAL tending to exaggerate soundstage depth, creating a pleasant, but not necessarily accurate perspective. When auditioned head to head with the Theta, it also appears to be blur individual musical voices, covering up low-level harmonics, effectively placing a barrier between the performer and listener. At the same time, the DS Pre is not hard-sounding or brittle in any way. There are, of course, still some digital recordings that will cause ear bleeds. But we all accept the theory about “garbage in, garbage out,” don’t we? Even with this in mind, I’ve been surprised at how much better most of my CDs sound with the DS Pre. No, it doesn’t turn ammonia into ambrosia, but the highly refined sonic performance of this product brings so much more music to my ears. It’s not a matter of covering up the imperfect, but rather a successful method of conveying what’s already them. For me, the Theta DS Pre is indeed a sound for sore ears. Although there are other products available which are certainly listenable, the DS Pre sets an entirely new standard of performance. No more colorations. No more artificially created euphonic sonic syrup to make the unlistenable more palatable. No more irritating digital haze and grit. I will admit that there are still problems to be addressed in digital audio, particularly in the original A/D conversion. But with the advent of the DS Pre, the nightmare of inadequate D/A conversion, with all of its attendant musical aberrations, can finally be put to rest. Aside from retrieving what is, in my opinion, the best sound ever from CD, the DS Pre offers so much more flexibility than dedicated products such as the CAL Tempest II. Whether or not you subscribe to the validity of digital sound reproduction, or even if you’re not in the market for a new audio toy, the DS Pre should be at the top of your component audition list. I would suggest, how ever, that you check your bank balance on the way to your local Theta dealer. It just might come in handy. Lewis sent me the first sample of the DS Pro, the one that ticked, so that I could compare it with the Accuphase CD player reviewed else where in this issue, as well as carry out some basic measurements. Fig.1 shows they analyzed spectrum of the DS Pro’s output when playing the dithered —90dB tone on the CBS CD-1 test disc. Apart from the intrinsic dither noise on the disc and the higher harmonics of the signal present between 10 and 20kHz, the waveform is commendably clean, as can be seen by the high level of the 1kHz band in the spectrum and the complete absence of any mains-related noise down to the -112dB measurement floor. The error in absolute level was one of the best I have measured, -90.31dB being reproduced as -91.5dB. Fig.2 Theta DS Pre: De-emphasis error, first sample. 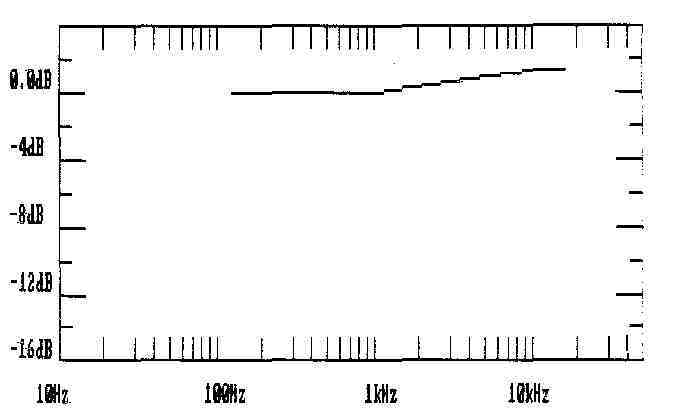 The basic frequency response of the Theta was commendably flat between 10Hz and 20kHz, without any ripples in the top audio octave. The Santa Fe sample, however, evinced a response error when playing pre-emphasized discs, the processor applying an inadequate amount of de-emphasis. 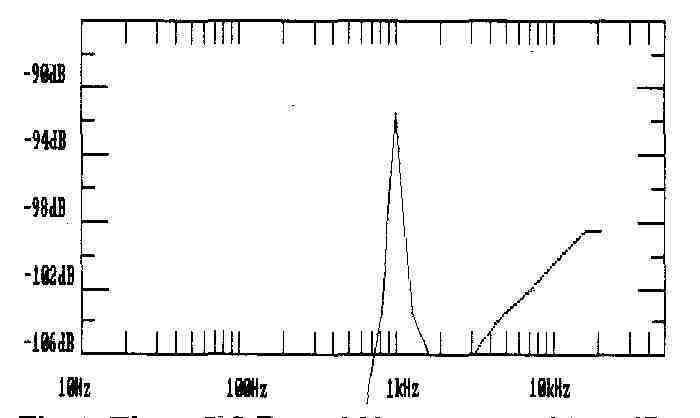 Fig.2 shows the error plotted against frequency, which reaches a maximum of +1.4dB at 10kHz with respect to the level at 1kHz. This will certainly be audible as a slightly “thin-sounding” character with pre-emphasized discs. To judge by Lewis’s remarks on the sound of the final sample of the Theta, I assume that this problem was corrected, but if you have an early Theta and its sound is inconsistently thin, then I suggest you contact your dealer about having it upgraded.